We drive south from the village of Cahuita. It is hot, but we are on a mission. We are going to complete what we stated we would do at the outset. But we are going to do it on our own terms. We had said that we would go to Panama because it was so close to Costa Rica. It made a logical point to turn stop, being the last country in continental North America. Also, the Pan – American highway ends for a bit, the Darien Gap between Panama and Columbia being impassable. So, we would either stop here or ship our car and ourselves separately, to Columbia. The idea was to live in CR for a while, and maybe side trip to Panama. It happened quickly and was decided quickly. So we were looking for the village of Bribri. It was just past here that the Rio Sixaola came close to the road. We came through the town and kept left, where the map showed the river to be. It took a few miles more before the road got really close to the water. We got out of the truck. 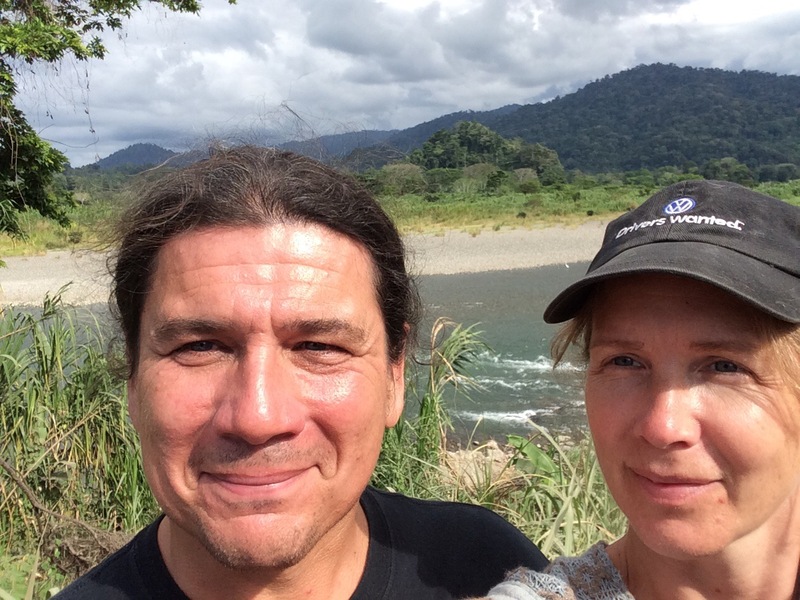 Looking across the river, we saw Panama, green and tangled, all jungly, just like Costa Rica. We took pictures. Selfies and one of the poptart. In my mind the centre of the river must be where the border was. I wanted us to at least connect with Panama. I threw a rock. It fell short, to my surprise. I threw another, so hard that I saw stars and my shoulder socket ached. It went no further than the first. We chatted a bit about what this moment felt like. It was weird, but it was right. I looked a bit more carefully in the gravel, searching for the perfect stone, slightly oval, smooth and with perfect heft- enough to feel but not enough to detract. Stepping back , I skitted forward then coiled, tensed, and released. I knew right away that this was the one. It sailed up over the Costa Rican side of the river, then plummeted down , clacking into Panamanian waters. Hello Panama, greetings from Canada! Satisfied, we stayed a few more moments before we got in the truck and drove away. After nearly four months going south, we had turned around. Rio Sixaola, Panama is beyond. And so the adventure heads north and in a while home. Think of the memories of the South trip and savor …with a glass of wine. Still checking in on you each night.